Drift down the canals of France. Celeste Mitchell slows her usual breakneck travel speed and finds the true rhythm of the French countryside. Mist hangs groggily around the avenue of trees that stretches out in front of us, and across the Earl Grey-coloured water. Burnished maple leaves lose their grip and pirouette onto the top deck where I stand with my mug of coffee. It’s 9am and we’re just waking up, but then things run at a slightly different pace when you’re cruising the waterways of France. We un-loop the ropes and pull out the metal pegs – our anchors to the bank – before opening the map to plot today’s course. We’re on the ‘back roads’ of the Nouvelle-Aquitaine in France, following an 18-metre wide waterway downstream, past villages whose names previously held no meaning to us, but have now become our bible. We set our speed and position by them. We see them not as blur from a railway platform, but study them intimately, viewing them from water level; wandering their streets with nary another soul about. Soak in the beauty of the old French towns and villages, so of which are centuries. The train journey from Bordeaux took two hours. We’re spending seven days backtracking along the Canal Latéral à la Garonne on a boat called The Royal Mystique – our own floating palace, equipped with two bedrooms, two bathrooms, and a kitchen. Motoring at a top speed of eight kilometres per hour, we’re inching our way along this marvel of engineering that was first revealed in full in 1856, having opened in three stages. Before the railway, and before oversized Aldi trucks thundering along highways, this was part of the main artery of goods transportation in France. Grain, wood chips, paper and wine – crates and boxes were loaded onto barges and carried across the country from Toulouse to the Atlantic. Its construction was a colossal project – it changed the way the whole area worked – but it look so long to build, the canal suffered considerably as rail became the transport du jour. See the breath-taking beauty of the old towns along the canals. Sitting stagnant since the 1970s, the canals have experienced a renaissance over the past two decades or so. 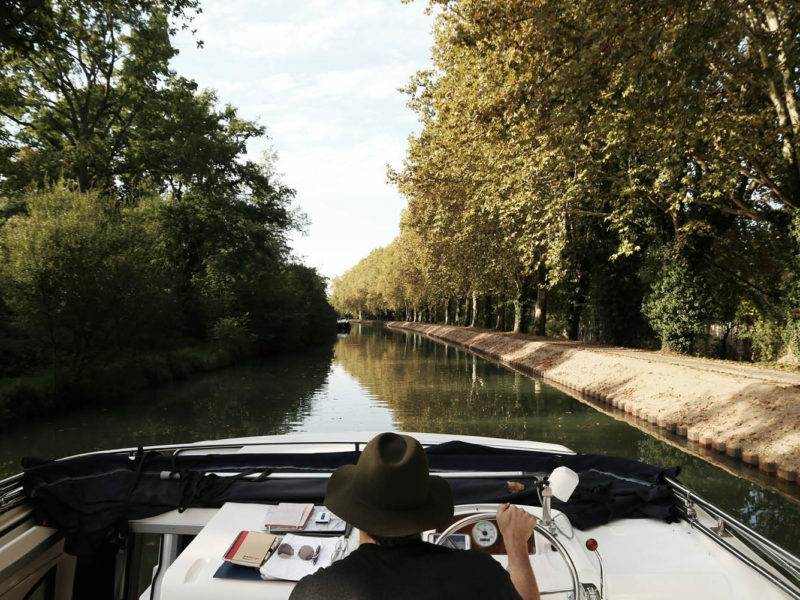 Just as the canal brought a change of pace to life in France, people are drawn to the rhythm of French life from centuries past. As fast-paced westerners, we wage an internal battle with ourselves over the first two days, trying to cram everything in. But just as lunch in these medieval villages becomes a celebration worthy of several hours, you can’t be in a hurry on a canal boat. Our first lesson is learning the lilt of the locks – there are 57 in total along the length of the canal, with a total drop of 128 metres. Curious passers-by stop to watch our choreographed routine – wrapping the ropes around the bollards and pressing the button to start – before we slowly sink and bob like a rubber ducky in a giant draining bathtub. Our speed is slowing, but we’re not in sync with rural France just yet. We ride bikes up to Auvillar, hailed as “one of the most beautiful villages in France”, and a stop along the Santiago de Compostela pilgrimage route, but as it’s Monday, it feels as though a zombie apocalypse could strike at any moment. Detouring off the canal onto the River Baïse, we press on past two ancient villages in a rush to reach the third, losing sight of what is right in front of us. We decide to cut short our pursuit of Nerac, as pretty as we’re told it will be, and dock for the night outside the fortified bastide of Vianne. Having backtracked, we’ve arrived after lunchtime so settle into fresh goat’s cheese and baguettes on board. If there’s one rhythm we find it easier to slip into, it’s the pulse of produce – where schedules revolve around weekly market days and the menu of the day celebrates the season. This region is, in fact, an agricultural heartland, with row upon row of plum and walnut trees, grape vines and sunflowers. The farms in this fertile valley are responsible for a large proportion of France’s foie gras. In Agen, prunes are celebrated by covering them in chocolate or soaking them in liquer. In Buzet, we stumble upon the local wine co-operative and enjoy a free tasting – it may not have the fame of Bordeaux but bears an Appellation d’Origine Contrôlée (AOC) certification all the same. Time grows sluggish, empty towns reveal as much beauty as bustling market stalls, and like the locals we pass, sitting on park benches enjoying the sunshine, we re-learn how to just ‘be’. By the end, we’re content to achieve nothing more in a day than a memorable three-course lunch overlooking the canal in Buzet-sur-Baïse. After all, where else do we need to be? Several boat companies operate from various points along the canals. 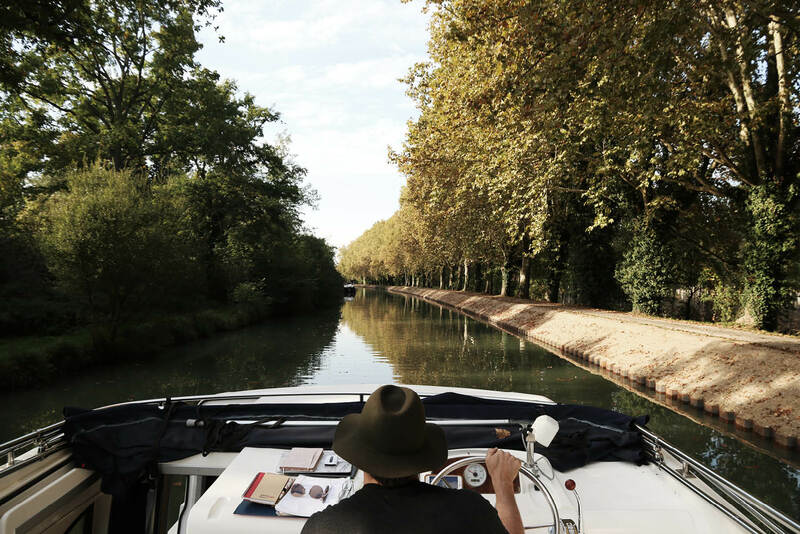 The UNESCO World Heritage-listed Canal du Midi is perhaps the most well-known, but Le Boat offers touring in 10 different regions in France. We travelled the Delicacies of Aquitaine route on the Canal Latéral à la Garonne. A Premier class boat starts from $3070. – You don’t need a licence to hire a canal boat, but a general familiarity with boats helps. – The Le Boat staff gives a complete run through of your route and the technical aspects of the boat, and help you go through your first lock. – Stock up on groceries before you board or stop at one of the towns where a larger supermarket is located. It also pays to work your itinerary around the local market days. – Prepare for everything to be closed on Mondays and most businesses to close during lunchtime on other days. – Don’t try to do too much. The beauty of this kind of travel is the time to simply take in the scenery. – Book at least nine to 12 months in advance, especially if you want to travel between June and September, to get the boat you want.